Egham team go the extra mile! "I just want to compliment the staff at Leighton's Egham for their outstanding customer service provided by both Ms Khokhar and Hassan. Believe it or not my visits to the opticians are always very nerve racking, I would prefer visiting the dentist. Ms Khokhar always makes me feel at ease and talk you through the processes. Similarly, Hassan’s customer service is exceptional, friendly, polite and very knowledgeable. He cares about developing a long-term relationship with you rather than just making a sale. I would recommend Leightons Egham to family and friends. Keep up the excellent service." Customer care is always our number one priority – but knowledgeable service, as mentioned, is a key factor in giving our customers what they deserve. Providing our team at Leightons with training and opportunities to learn is what keeps them experts in their field. Hassan has recently completed The Ocular Hygiene course by Spectrum-Thea with flying colours. The Ocular Hygiene course is designed to educate specialists on preventable conditions such as Dry Eye and Blepharitis, two common complications that can be repaired with good eye hygiene. 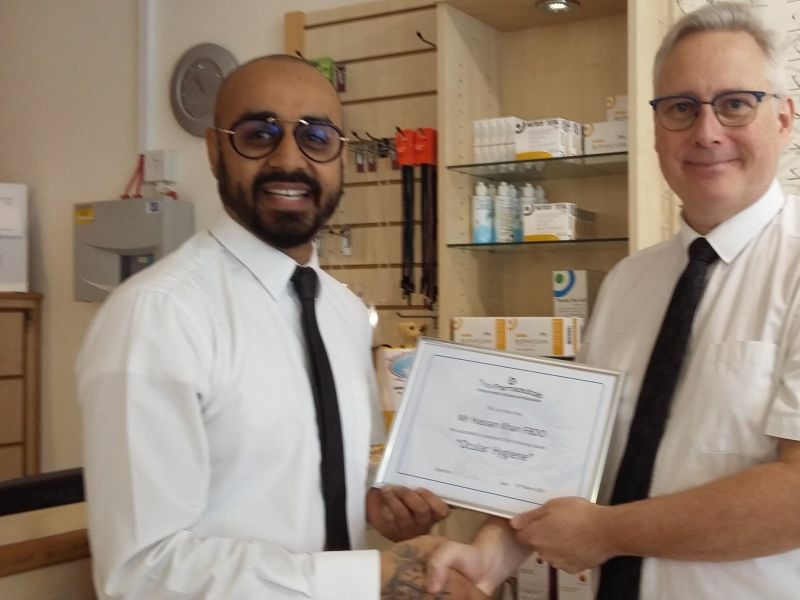 Now Hassan is fully qualified in The Ocular Hygiene course, he can continue giving customers a great experience with the added benefit of assisting them preventing future eye health issues. Congratulations Hassan! Dry Eye and Blepharitis can happen to anyone, but the risk does increase as you grow older. Regular eye examinations will help prevent conditions such as these from occurring, you can book an eye examination online or call your local branch on 0800 40 20 20.